Travel does what good novelists also do to the life of everyday, placing it like a picture in a frame or a gem in its setting, so that the intrinsic qualities are made clearer. Travel does this with the very stuff that everyday life is made of, giving to it the sharp contour and meaning of art. 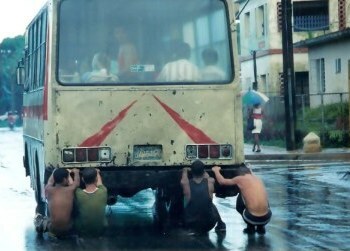 One such event for me to frame in this way happened on a wet Havana day, when the troubles of everyday life were put in perspective by a cameo story that unfolded before me. 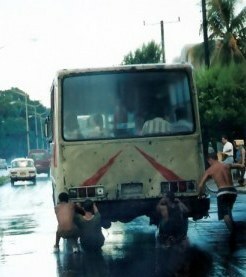 The drainage system of Havana has long since stopped being able to cope with torrential rain, and this day proved the point. 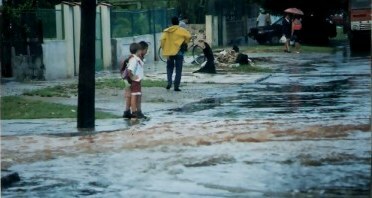 We were travelling back from dance lessons and saw these Havana school children pausing to pick a way across the flooded street. Mothers carried their primary school aged children above the water as it backed up from the flooded drains. A bus swished around the corner. As if they had been waiting, suddenly two young lads appeared and grabbed the bus bumper bar, using it to ‘water ski’ behind. It was good sport and naturally needing to be shared. Spontaneously, with no beckoning, two other lads joined in. 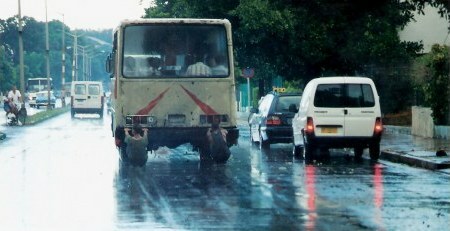 On the higher part of the road there was not that much water – just enough for them to keep scooting along. Then came the corner - and yells of delight as they were dunked in the deeper water and backwash. Havana street water-skiing has the same propensity to dunk you as any other form of water skiing. When you look around you, life is full of such stories and they give even the loneliest person some share in the life of others. For a moment when you come across these cameos, you somehow connect with the spirit of those you are watching – and emerge the richer for the experience. In the van travelling behind the bus where we saw the exuberance of youth and the absolute delight such a simple activity brought, several of my dancing colleagues uttered cross "tsk, tsk" comments, tut-tutting about risks. They were being terribly correct and self-righteous about how dangerous this was, and how it should be illegal. It made me grieve for any children they might later have. Perhaps because my childhood was laced into colour by similar delightful activities, it reminded me of Kate Hepburn, who broke most of the rules.